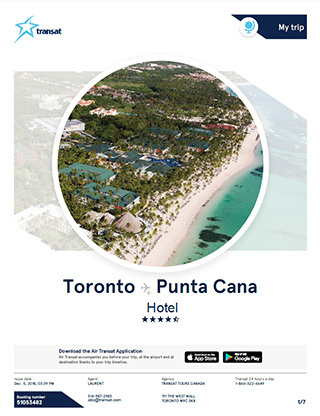 Transat has announced that effective immediately, all travellers who have booked a package via TTS (South or Europe package) will find the details of their stay on all new customized travel documents with revamped design. As of the first page, travellers will be in vacation mode, Transat says, with a visual overview of their hotel and their type of room. The itinerary is presented in a clear and personalized manner, in particular by specifying the precise baggage allowance to which they are entitled with their reservation. A host of small improvements have been made to simplify the traveller's journey, including an identical header and footer on all travel documents, detailing the flight, the hotel transfer, excursions, etc. -- as well as the contact details of the agent responsible for the booking.